If sisig and pizza are two of your favorite food, why not have both? The wonderful world of fusion cooking brings us sisig presented differently on the buttery goodness of Italian crust and cheese. For those unfamiliar of sisig, it is a Filipino dish made from chopped pig ears and cheeks usually seasoned with vinegar and calamansi juice. ‘Sisig’ originated from a Kapampangan word which means to make a salad from unripe fruits like green papaya or guava with a simple salt and vinegar dip. But that was the ’70s. Today, it is often served in hot plates and is a much loved partner of beer in the Philippines. Just like any other pizza, this requires a pizza crust. Use sisig as toppings, along with lots of cheese. 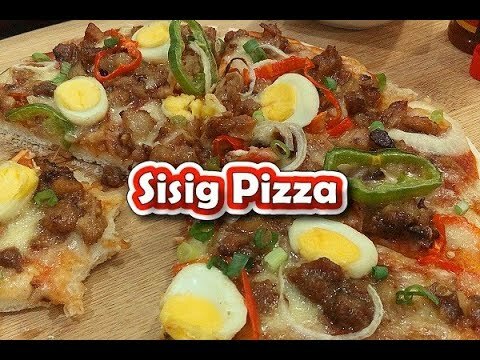 Sisig Pizza Pie is something that will be appreciated not just by sisig lovers but by everyone looking for a whole new twist to the much beloved pizza. Make. This. Sisig Pizza. Now. Preheat the oven to 480. Place the pizza dough in a flat surface then spread the pizza sauce equally over the dough. Grate the Mozarella Cheese and spread. Spread the Sisig over on top of the pizza sauce with cheese. Arrange the red and green bell peppers, then the onion and sliced eggs on top. Place the pizza in the oven then Bake for 8 minutes or until cheese is bubbly and pizza dough is toasted on the side. Serve with Iced Tea or with your favorite Soda drink. Previous Post: « PinoyRecipe.net is Giving away $200 Christmas Shopping money! Have yet to try a fillipino pizza, I will for sure. Omgosh this looks AMAZING!!! So delicious!! Can’t wait to try it!! Wow! This looks tasty, both of my fave in one? I’m hungry just looking at it. This sounds delicious, definitely going to try. Thank you for sharing your pictures! I want! I love sisig and pizza! Better when combined! We love pizza, I will have to give this a try for the holidays ! Thank you for sharing this recipe. It really looks delicious. It sounds interesting. I will try nearly anything. I have never ever heard of this but it does look good.